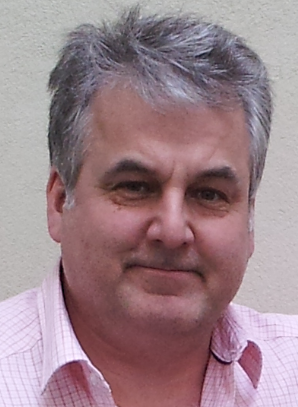 My name is Monty J McClaine and I live in England, am married with two soon to be grown up children, and am an independent author who has written a series of twelve short children’s stories (the Christmas special edition being a little longer than the others) about a small family who have a very loving and precious dog who is like other precious and loving dogs, except my dog has the power of super speed, along with other abilities. The name of the series is Super Speed Sam, and at writing, I currently have 3 books released through Amazon.com. And the result of your writing? I believe I have succeeded in creating a fun and exciting series of children’s short stories, with lots of adventure and splashes of humor, all set at a pace that I hope will keep the children reading (or listening to) the stories the whole way through. And who are these stories for? Stories that will delight both boys and girls; the young and the old, and not forgetting Moms and Dads of course! Stories that allows children and parents to be children once more sharing their thoughts and kick starting their imaginations. Stories that allow a return to simpler values that may bring families closer together. 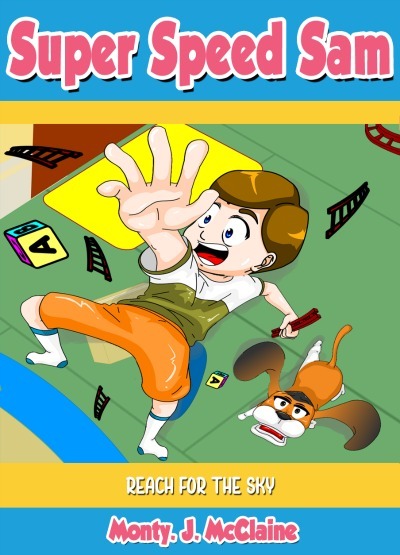 Reach for the Sky: Super Speed Sam, Book 2 is a children’s animal book for grades 3-6. Sam’s a basset hound who loves the McClaine family. He’s especially close to baby Molly, but he also takes special care of six-year-old Jack, who has a propensity for getting into trouble. Molly was upset and having a hard time getting to sleep one night. Her favorite doll, Ted, had mysteriously disappeared. Molly’s Ted was made by her father when he was creating a new character for one of his books. Ted had a yellow hard hat and wore construction gear, and Molly took him everywhere with her. Her mom finally got her to go to sleep, but then a huge crash woke Molly up and sent Jack’s mom running to check on him. You see, Jack designs all sorts of tracks for his electric trains to run on, and he had thought up a grand new design, but he was short two lengths of track. He knew where that track was -- it was stored away on top of a very tall dresser. His dad put it up there as a punishment for him upsetting Molly the other day. Jack thought long and hard about how to get that track down, and he finally came up with the perfect plan. Sam wasn’t so sure about that plan and was ready to make a move when, not if, something awful happened. He had to watch for Jack’s safety, but he also had to rescue Ted, who was tied to Jack’s railroad tracks. 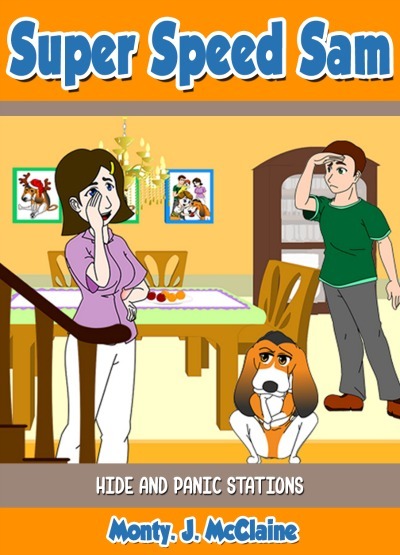 Kitchen Decorations: Super Speed Sam, Book 3 is a children's animal book for grades 3-6. It was a rainy afternoon, so no one could go out and play. Mom decided to make a cake, with Jack as her helper, and Molly and Sam as spectators. Everyone was pretty excited, especially Jack. He was so excited, in fact, that he rushed through the first step -- washing his hands. Mom decided to make the hand-washing process into a fun lesson before the cake; then it was time to get the flour. Just when it was finally getting interesting for Jack, and they were measuring out the flour and getting the eggs, the doorbell rang, and Mom went to answer it. Jack was so enthusiastic about the cake-making experience that he couldn’t help but get a bit inventive while he was waiting. He decided to toss the eggs up in the air and catch them with the bowl. The only problem was; he wasn't too good at getting them to land properly. 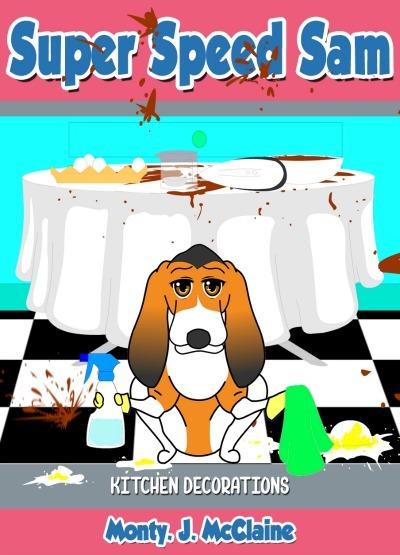 Things went from bad to disastrous as Jack made a total mess of the kitchen while Molly cheered, and Sam wondered just how he'd clean up this mess in time. 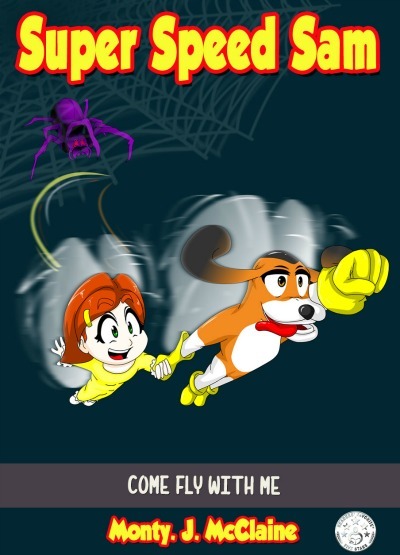 Come Fly With Me: Super Speed Sam, Book 4 is a children's animal adventure book written by Monty J. McClaine. Basically, it tells the tale of a dog called Sam and his human family, composed of Molly, Mom, Dad, and Jack McClaine. Molly is the baby of the family and she shares a special bond with Sam. One day in particular, Sam and Molly are unexpectedly transformed into flies. Molly ended up stuck in a spider’s web with a huge menacing spider approaching her. She tried with all her might to pull herself free from the sticky web. Sam came to her assistance and, using his super speed powers, he succeeded in cutting Molly from the spider’s web. As flies, they landed in the kitchen, where Mom McClaine tried swatting at them. Even in the garage, when they alighted on Dad’s spotless red Corvette, he too tried to shoo them away. The McClaines faithful basset hound, Sam, knows how to use his super speed powers, even in a pinch, keeping it top secret from everyone except for baby Molly, of course. What he does NOT know is how these powers started… that’s a big secret to him! Sam knows it’s a ‘family thing’, having been passed down through generations of ‘Sam’s’ from long ago, he doesn’t know why, where, how or what got these amazing abilities started. Well, hold onto your seats because in this extra special Super Sam episode, you’re about to find out! Whether following Santa and his reindeer on their highly eventful Christmas Eve journey, discovering a special ‘sleigh recovery’ team of elves or meeting Sam’s great, great, great (add a whole bunch of ‘greats’), you won’t be able to put this holiday special down! 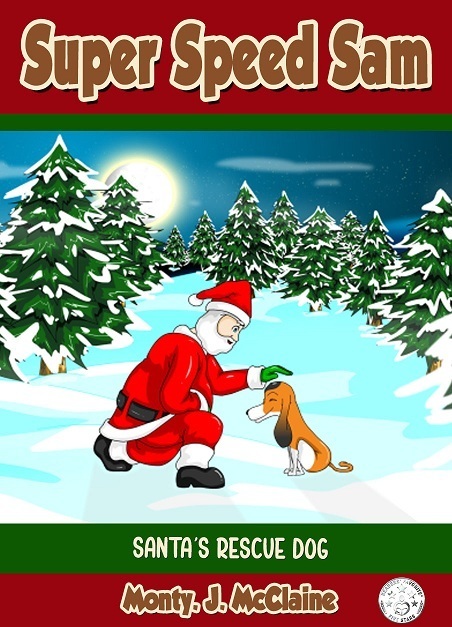 Read the exciting, humorous and sometimes tearful special Christmas episode, Santa’s Rescue Dog to find out! Sam might not know where his secret abilities come from, but now you get the chance to uncover the truth of the mystery in this fun, sweet, adventurous ‘Sam’ story! We all know about the dangers that can be found within our homes. We also know how brave our small children are, and how professional are emergency services are - but how can we prepare our young ones if the unmentionable ever happened - prepare them in a fun way - without them feeling uncomfortable, panic stricken or afraid? Perhaps we can help them with a fun story – but does such a story exist?